The whole of magical theory and practice turns on two points – auto-suggestion and the astral light. These two points must therefore receive the careful consideration to which their key position entitles them, and not be employed as stick-on labels – terms of abuse that explain nothing but discredit everything. Auto-suggestion is a method of manipulating one’s own subconscious mind and persuading activities that go on beyond the control of the will to obey its behests – performing their subliminal work and delivering the results to consciousness in the form of a finished product in whose fabrication one has had no conscious part. Remarkable results can be obtained in this way, character and habits being changed and unsuspected energy released to a degree that has to be experienced to be believed. The technique of this operation is simple – so simple that it eludes our rational minds as an object held too near the eye becomes indistinct – the subconscious mind has to be approached by means of the imagination, completely disregarding reason, will, and concentration. One has, in fact, to rely on cannoning off the cushion, for a direct approach defeats itself. There is a knack in this procedure which has to be laboriously acquired, and its satisfactory use depends on the right understanding of one’s condition and needs. It will be observed that I say “satisfactory”, and not “effectual”, for it is possible to use auto-suggestion most effectually with very unsatisfactory results if one’s philosophy of life is remote from the facts – a by no means uncommon state of affairs. The effectiveness of an appeal to one’s subconscious mind by means of the imagination is greatly enhanced if one reinforces one’s subjective operations by an objective appeal in the shape of symbolism and ritual. We all know how much more vivid is the film than the story; how much more vivid modern sound-film than the old silent one. Obviously all the trappings and paraphernalia of ceremonial magic afford most potent appeals to the imagination, and through it to the subconscious mind with all its but dimly realized resources. Is this appeal to subliminal energies the beginning and end of occultism? There was a time when I was inclined to believe that it was, but wider experience has convinced me that it is not, though I am not prepared to subscribe to the school which believes that magic is purely magical. A very large psychological element unquestionably comes in to it; for if the appeal to the imagination is ineffectual, all that follows is nullified, being counter-suggested. A sense of humour is the great enemy of magic. Anything that distracts the attention or appeals to one’s sense of the ridiculous effectually destroys the power of a ceremony. Makeshift cardboard symbols, painted plywood instruments, crumpled and skimpy sateen vestments, the drawing-room furniture pushed into the corners and a smell of cooking coming up the back stairs will destroy all magical power as effectually as an exorcism with bell, book and candle; while, on the other hand, a ceremony performed with the simplest dignity will not fail to achieve its purpose. The occultist can do what the Elizabethan play-goer did – provide his own Forest of Arden on an empty stage, but he cannot overcome the banal effects of home-made props borrowed as like as not from the housemaid’s cupboard. It is amazing to me that occultists fail to realize that a magical rite is a religious ceremony, and treat it as if it were amateur theatricals before an uncritical audience. A Temple of the Mysteries may be as bare as a Little Bethel, but at least it should be a consecrated place that does not outrage one’s sense of good taste. Even if the cardboard impedimenta and the cotton vestments are held to deceive the Powers invoked, they do not deceive either operators or spectators, and effectually nullify the psychological appeal of the ceremony. That ritual can be effectual under such circumstances proves conclusively that another factor beside auto-suggestion comes into it. This other factor we will call, for want of a better name, by the traditional term of the Astral Light. This, of course, is the great stand-by of occultism that is used to explain everything. Occultists of the credulous, traditionalist type cling to the Astral Light as if it were a solid object, the word auto-suggestion being a shibboleth which proves the user to be not of the elect. I cannot accede to this, for auto-suggestion so obviously plays an important part in magic, as is clearly discernible by all who know what to look for. Equally, however, I shall write myself off as unscientific and superstitious by making use of the term Astral Light, but I beg leave to define my terms. To argue with the crass materialist is as useless as arguing with the bigoted believer, these twin attitudes being the two sides of the same psychological coin; so I will content myself with an appeal to the experience of those who are sufficiently sensitive to have had intimations of supersensible realities. They will, I think, be able to confirm the statement that these are of more than one kind, and represent distinguishable strata of tangibility. The densest type is perceived semi-physically as a tingling sensation, like a weak electric current, a wave of heat, or a draught of cold air; even, sometimes, as a sense of touch or generalized weight. A subtler type is perceived as a kind of emotional tenseness in the atmosphere, as when waiting for some important event to take place before one’s eyes, surrounded by a crowd who are all expecting the same thing. This emotional tenseness can, and is in fact deliberately employed, to produce all manner of subjective effects, ranging from mental stimulus right up to hallucination. It is easy to show the psychological factor in so-called occult phenomena, but it is not so easy to account for the stimulus that regularly and under willed control calls those phenomena into being and determines their type. Any one who is, as I am, intimately acquainted with both psychotherapy and ceremonial magic, cannot fail to be aware of the difference not only in the degree but in the kind of influence exerted by them. I am fully prepared to concede the psychological factor in ceremonial, but I would also ask for the astral factor to be taken into consideration, for it unquestionably exists; on this point I think I may beg to be excused the criticism of persons who have not had any experience of the working of occult rituals. Let us now consider in detail, and elucidate by contrasting, these two types of subtle energy that experience and occult tradition both declare to exist. The denser we will call etheric energy, and the subtler, astral energy. Etheric energy we have already studied at considerable length in these pages, though our approach has been empiric rather than philosophical, so it must suffice to say that it is the magnetic field of a living creature, and refer the reader to the orthodox presentations of electro-magnetics for further information concerning the nature of a magnetic field. This will be found to apply, allowing for the fractional voltage, equally well to the aura and its extensions as to the more obvious forms of electrical activity. All that is needed for its detection is an instrument that can magnify an electrical current in the same way as an amplifier magnifies a sound, for etheric force is purely physical and entirely objective. Sensitivity to it varies within as wide limits as sensitivity to musical pitch, and depends likewise on a basic natural capacity and its cultivation. The perception of the astral influences is a subtler affair, and is entirely subjective; that is to say, they are of the kingdom of mind, not matter, and we perceive them with the mind, and not with the physical sense organs; but in a manner that is well known to those who have experience in such things, but of which I have never heard a satisfactory explanation, these subtle impressions are best perceived by focusing the attention on certain spots in the etheric double. These are the charkas of the Yogi, or the Sephiroth of the Central Pillar of the Qabalist, and the principal of these, for clairvoyant purposes, is the centre in the forehead between the eyes, which is called in the East the Ajna charka. 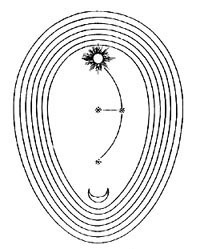 In the West, the Qabalist regards the mysterious Sephira Daath, which has no place on the Tree of Life or symbolism in the Sepher Yetzirah, as the centre concerned with extended consciousness. He, however, locates it at the back of the neck. The superficial correlation, therefore, is with the Visuddhi, or throat centre of the Yoga system, but this, I am satisfied, is incorrect. The true location of Daath is where the spinal cord joins the brain; that is to say, at the base of the cerebellum; the direct developmental association of this with the fore-brain, where the Ajna centre is located, will be obvious to anyone acquainted with anatomy. At any rate, whatever arguments back and forth there may be, it is in the spot at the root of the nose that the sensation is felt when the psychic senses wake up and perception is willed; but there is, in my experience, and that of others with whom I have compared notes, a sensitive spot at the back of the neck where one is aware of an uneasy sensation when consciousness is being called up by an incoming message from subconsciousness. Perhaps this is due to the fact that the cerebellum, or little brain is the old, original brain of the vertibrates, developed at the same time that what we now call sub-consciousness was developing, and is therefore its appropriate and habitual organ; the main brain being the organ of consciousness, developed when the higher mind was developing in the course of evolution. There are, so far as I can see, likewise two kinds of psychism – that which depends upon the development of the centres in the etheric body to act as sense organs and transmitting centres, and that which depends upon a change in the mode of consciousness. This change of consciousness involves oblivion on the physical plane while it is in function, and has been called the higher trance, or Samadhi. Its link with consciousness, if such exists, and it often does not, is through the dream channels of the subconscious mind, expression being formulated by means of vision-symbols after the manner well understood in dream-psychology. It is one of the aims of the occult technique to forge the link between super-consciousness and subconsciousness and aid the formulation of those subconscious cartoons representative of super-conscious experience. It is one of the aims of the Hatha Yoga technique to develop the etheric double into an effective instrument of the astral forces.